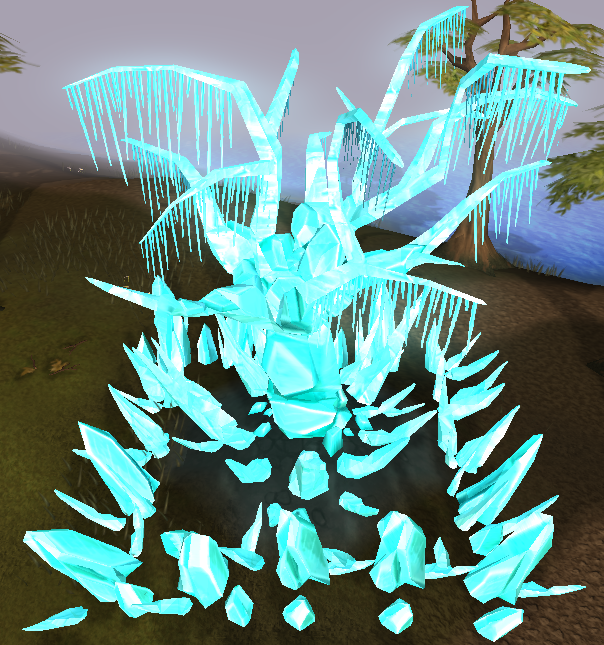 Crystal Trees can be cut at level 94 Woodcutting. They are designed for pure Woodcutting XP, and give no direct yield. However, you can obtain Crystal Geodes, which are the Crystal Tree’s version of the bird’s nest. Here you will learn the locations of the trees, and how to interpret the clues they present of finding the next one. As you can see, the trees are placed in a roughly diamond-shaped formation. However, there is no tree in Prifddinas, the Crystal city, that can be cut with the woodcutting skill - only harvested for Crystal Blossoms. The trees move roughly every 2 hours. Once the tree moves, you can look at the tree, which will point you in the direction of the next tree. For example, if you look at the Lighthouse tree, and the clue is “The tree leans slightly to the south” the active tree is at Yanille. 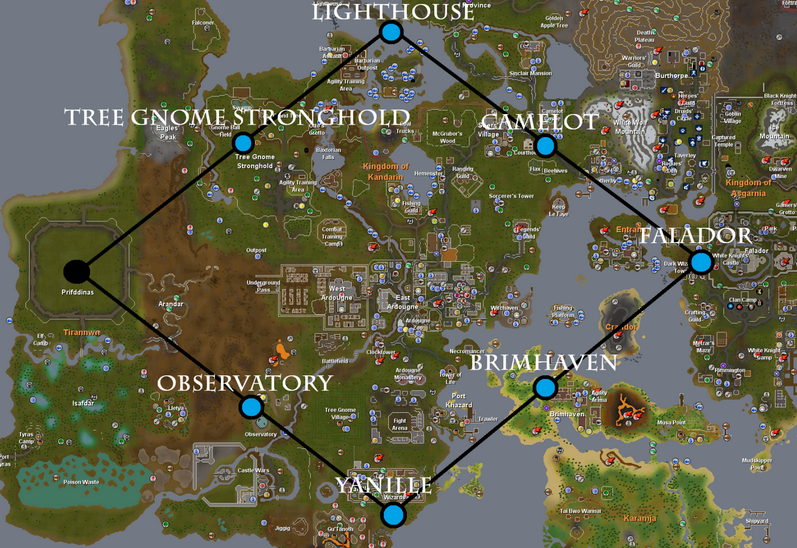 If you get the clue “The tree leans slightly toward the north and west” when at the Brimhaven tree, the active tree will be at either the Lighthouse, or Tree Gnome Stronghold. If you look at the active tree, it will say “The tree points towards the heavens”. Also, if you have unlocked access to the Max Guild garden in Prifddinas, which requires completion of the Plague's End quest and at least one level 99 skill (or a Quest Point Cape), you can attune one of the skilling portals to the active Crystal Tree. When the tree moves, you can make your way to the guild, be it by lodestone, or crystal seed teleport to the Cadarn area, or with your Max or Completionist capes if you are skilled enough (pun intended) to have obtained either of these, and simply step through the portal to find the new tree. This makes locating them incredibly easy as you need not even check the tree when it moves to try and pinpoint its location. 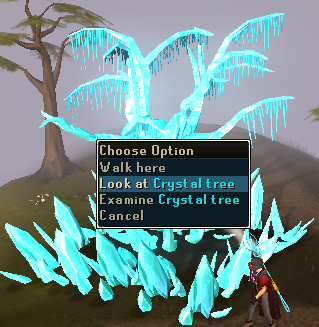 Once you find the tree, you will chop at the Crystal Tree Shards around the base for XP. A successful cut will yield 434.3 Woodcutting XP, however you will gain no items. This is a method designed to allow you to train Woodcutting without having to drop mass amounts of logs, similar to Ivy. 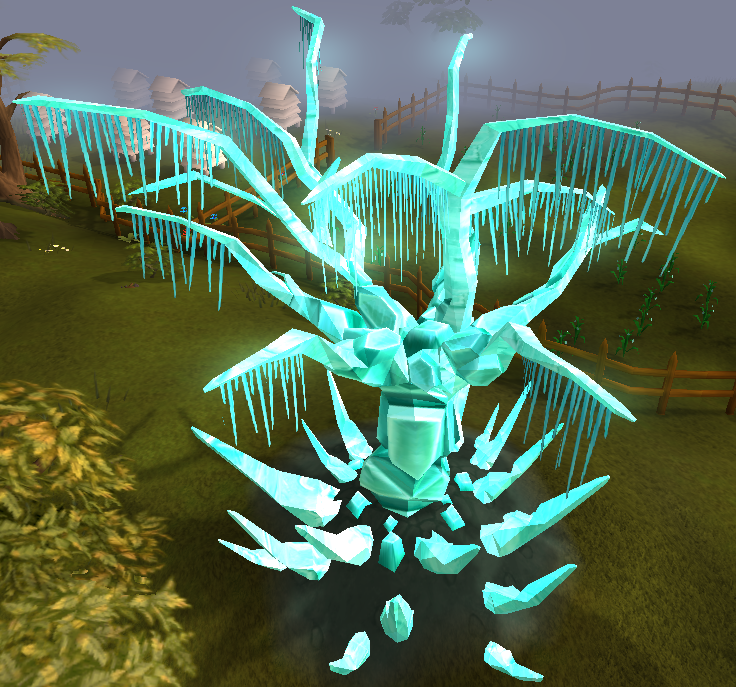 At Crystal Trees, you can expect XP rates of approximately 105,000 XP per hour, and up to 115,000 with a Crystal Hatchet. Crystal Geodes are the bird’s nests of Crystal Trees. They will drop on the floor randomly and must be picked up quickly, as they disappear after 30 seconds. You can then shatter the Geode for a reward. You will either get an uncut gem up to Dragonstone, a Crystal Seed, or a Crystal Triskelion Key piece. The two latter rewards are very rare. A good idea is to horde your Geodes on your bank, and open them all at once. This will prevent you wasting bank space on multiple types of Uncut gems. The Lumberjack outfit, obtained from Temple Trekking, will give a 5% XP boost to Woodcutting if the full set is worn. Individual items can be worn if you do not have the entire outfit for a lesser bonus. The Lumberjack aura will give you an increased chop rate, which will help increase your hourly Woodcutting XP rate. This aura, alongside most other auras, can be obtained from the Solomons General Store, and is purchased with loyalty points. The Tree-Shaking Scrimshaw will give you an incredible boost to your likelihood of receiving Crystal Geodes. They also have a chance of spawning a random impling from the tree, all the way up to Kingly. You will only recieve implings which you have the Hunter level for. These can be made from player-owned ports, or purchased on the grand exchange. They last 3 hours of use, and can be toggled on and off at will. The Superior Tree-Shaking Scrimshaw is untradeable, so must be made by you in your Player-owned port, however they give an even greater chance of spawning Geodes and last for 4 hours. Both of these require 80 Woodcutting to equip.